The end was clearly in sight. That Winter of 1944/1945, in the villages in which we had operated, we ate cakes and drank "monopolka", the potato gin of the region. We had previously started to round up the girls who had gone out with Germans and shaved their heads. That too was a sign the end was near. 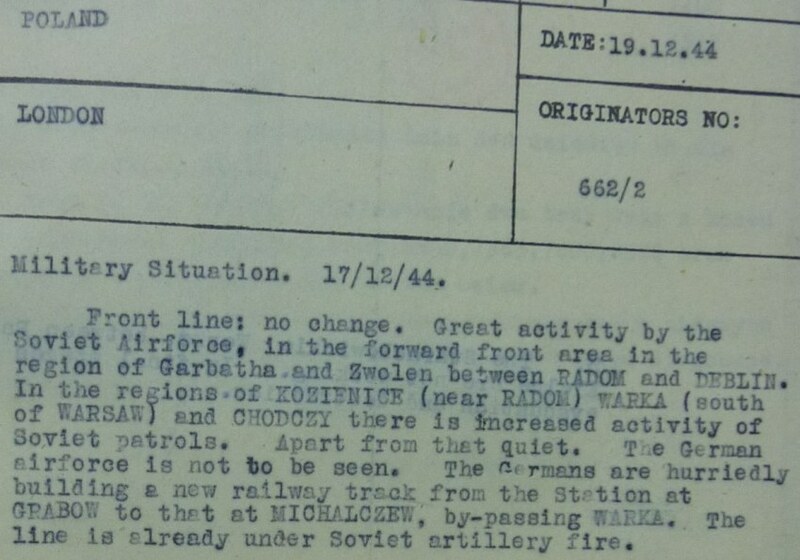 We knew and the Germans knew that the Russians were advancing toward our positions. We fought two more major battles during the late December 1944 - January 1945 time period. The best known massacre in the country instigated by the Russians took place on December 23, 1944 in Ochotnica. The Germans came up to the village around December 23rd to collect food for Xmas dinner and got in a fight with a Russian band of about a dozen men. Three German soldiers were killed by the Russians, and the next day the Germans took revenge by executing 56 of the Polish villagers, including 2 six-month-old babies. As well, 29 farms were burnt to the ground. Among the 56 killed there were five members of one family. Two of the (Gorale) highlander brothers who helped the B24 crew down the hill the first day were part of that family. They survived. As well, our camp at Ochotnica was attacked by 1,000 enemy troops and we fought for three days before we scorched our way out leaving 200 Germans behind us. One of the last attempts by the Germans to break the Polish underground activity occurred mid January 1945 in the Szczawa region in the Carpathians hills (by the slopes of Mogielicy by the Grand Peak (Wielkiego Wierchu) and Kiczor). 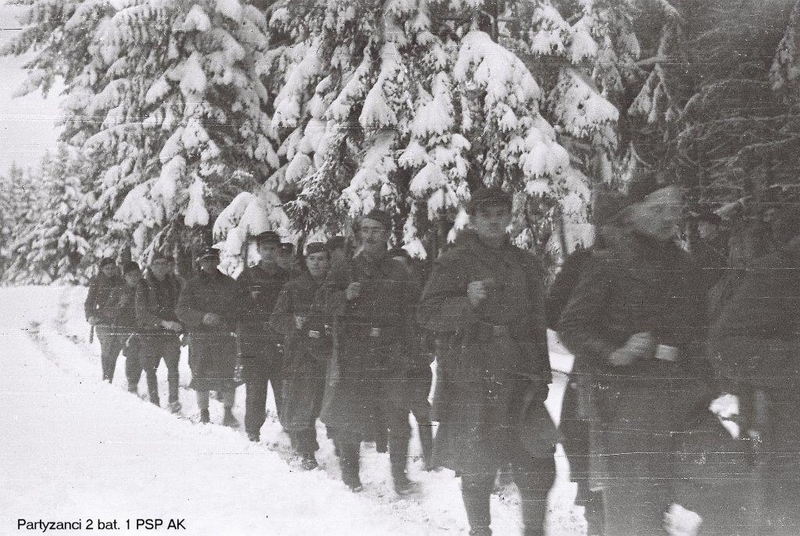 The in-country German army command was well aware that local mobile Polish army resistance forces (1 PSP AK) in this region, could critically endanger the safety of the German forces should they have to retreat as a result of a looming Soviet offensive (crossing the frozen Dunajec river). To this end on January 10th 1945 in an effort to pacify the area the German SS troops initiated the engagement with a raid against our partisan forces in the Łącko – Kamienica – Lubomierz region. At 2:15 in the morning of January 12, 1945 (see partisan communications message link) the Russians started their offensive and the front started its slow but steady movement forward. The Russians had waited for the rivers to freeze over before they started their movement west. The Russians were of the opinion that they would have the upper hand in the cold of winter. Our extended battle, which had started on January 10th finally, on January 13th, 1945. became focused in the town of Szczawa – near the sawmill. In a final 14 hour drawn out engagement where approximately 100 of our guerilla fighters battled a German SS force numbering by some estimates approximately 900 soldiers. Despite prolonged heavy mortar and machine gun fire, and the fact that we were clearly outnumbered by the Germans, we were victorious resulting in a rapid German retreat. Some 18 SS soldiers were killed and about 30 wounded. Our losses were 1 killed (23 year old rifleman Zdzisław Kaszycki "Wiesław”) and 1 wounded (Franz Tesik an Austrian, a deserter from the German army who fought in the ranks of 1 PSP AK). It should be noted at this time the 1 PSP AK units were extremely “seasoned” and capable and demonstrated great steadfastness even at critical moments when it would appear that they would be outflanked. John and I were on our way to Major Borowy’s headquarters to fetch money for the boys when I first saw the Russians. Their motorized columns were screaming down the highway. Other British National Archives documents such as contained in file HS4_145 Ref 3.42 indicate that in the late September 1944 to early 1945 time frame there was some distrust that exsisted between the British Chiefs-of-staf, SOE and Polish Colonel Jazwinski with the the London based Polish Government in exile, and in particular General Sosnkowski. It is not clear if the infighting and the view of the limitations of aircraft flown out of Italy and the encouragement of false hopes played into the delay and/or planning of the Jodłownik rescue mission. Despite General Sosnkowski's order that "local Commanders were to declare themselves to the advancing Soviet Armies and state that they were members of the Home Army" Ref 3.42 , the Polish partisans had been very blunt with the evaders telling them that once the Russians started to advance, they, the partisans, would dissolve into the woodwork. They further cautioned that if the evaders showed any recognition of their partisan protectors, they would have effectively signed the partisans death warrant as the Russians viewed the partisans as "bandits". Bandits were immediately shot. That was the degree of fear that the partisans had for the Russian liberators. Late that night, we slipped back through the Russian front line to our hideout only to find the U.S. boys already gone with only F/Lieut. Schoffer remaining!
" I told (the Americans) to wait a few days until the first line troops had passed, but they would not listen and departed on their own." Schöffer had then waited for this first wave of Russian soldiers to pass whereupon John and I had returned to the safe house in Szyk. On 19th January 1945, Polish AK Army Commander General Leopolda Okulickiego had given formal orders to dissolve the Armii Krajowej. Accordingly, Major Borowy was ordered to disband the brigade and disperse the men to their own villages. Part of the Home Army remained in hiding, others returned to their homes as orderd, some left the country over the coming months. Most of them maintained communication with each other and with their former superiors. After the section disassembled in January 1945, its soldiers returned to their families and homes with high hopes for a return to normal lives. Their weapons, with the exception of handguns had been stored in a place known only to the section's Command. This precaution was dictated by the mistrust of the Home Army's ex-guerillas whose ties to the Polish Government in Exile in London were in sharp contrast to the new "Lublin Government" brought to POland "on the bayonets of the Soviet Red Army". The decision to hide the weapons was based on reports coming from Poland's Eastern Lands occupied now by the Russians. The reports informed about arrests, deportations to Siberia, and executions of former members of the Home Army (AK) by the Russian intelligence service the NKVD. Soon after the Russiand entered our region, those who found themselves on a KKVD list were arrested and in some cases deported. NKVD officer Ivan Zolotar, posing as a Russian Partisan Commander, masterminded this list. John, F/L Władysław Schöffer and I waited until the second line of Russians went through and after several farewell "parties" with Father Hubert and others in the area departed for Warsaw, in the latter part of January 1945. I'd heard through my partisan contacts that the NKVD was looking for two British soldiers who'd fought with the Armia Krajowa!! We were wearing khaki uniforms now that had been sent to the partisans on the various para–drops from Italy and our cover story was that we'd just escaped from a POW camp. John and I intended to intentionally kept a very low and very passive profile from the moment we encountered the Russian line. Schoffer threw away his Polish Air Force identity card and used an old RCAF station pass to convince the Russians he was a Canadian, since we were certain that he would be shot immediately by the Russians if they thought he was a Pole. A Russian patrol soon picked us up. Then began our travels – and the long route home.